Setting aside changes proposed by the previous government to Food Safety and Standards Act, the government today said fresh amendments would be made after further consultations in this matter. A decision to withdraw the existing amendments to this Act was taken this evening by the Union Cabinet, headed by Prime Minister Narendra Modi. The UPA government had proposed amendments to the Act to expand the composition of the Food Safety and Standards Authority of India (FSSAI) and dispense with some conditions in public interest while making regulations on food. "The Cabinet gave its approval for withdrawing the Food Safety and Standards (Amendment) Bill, 2014 as introduced in the Rajya Sabha on 19.02.2014," an official statement said. The Food Safety and Standards (Amendment) Bill, 2014 needs to be further amended after taking into account the judgements of the Supreme Court, Lucknow Bench of theAllahabad High Court and representations received by the government and other recent developments, it said. "Based on further examination, a fresh set of amendments will be finalised by the Ministry of Health and Family Welfare," the statement added. A BILL further to amend the Food Safety and Standards Act, 2006. 1. (1) This Act may be called the Food Safety and Standards (Amendment) Act, 2014. “(aa) Chief Executive Officer of the Food Authority, Member-Secretary ex officio;”. 3. After section 7 of the principal Act, the following section shall be inserted, namely:—“7A. The Chairperson shall have the powers of general superintendence and directions in the conduct of the affairs of the Food Authority and shall, in addition to presiding over the meetings of the Food Authority, exercise and discharge such other powers and functions of the Food Authority, as may be assigned to him by the Food Authority.”. “Provided that the Central Government may, in the public interest, by order in writing, dispense with the condition of previous publication in any case.”. Insertion of new section 7A. 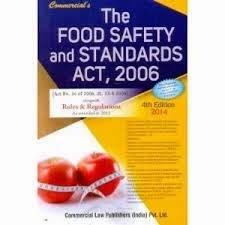 The Food Safety and Standards Act was enacted in the year 2006 with a view to consolidate the laws relating to Food in the country and to establish the Food Safety and Standards Authority of India for laying down science-based standards for articles of food and to regulate their manufacture, storage, distribution, sale and import and to ensure availability of safe and wholesome food for human consumption. 2. Sub-section (1) of section 5 of the said Act provides for the composition of the Food Authority consisting of a Chairperson and twenty-two members, which does not include the Chief Executive Officer. It is proposed to include the Chief Executive Officer in the composition of the Food Safety and Standards Authority of India. food technologists and scientists, farmers' organisations and retailers' organisations. Therefore, it is proposed to amend sub-section (1) of section 5 of the said Act so as to provide that the provision regarding one-third members being women, shall be applicable to the members referred to in clauses (b), (c), (d), (f) and (g) of sub-section (1) of section 5 of the said Act. Chairperson to guide the affairs of the Food Authority. 5. The section 92 empowers the said Authority to make regulations by notification with the previous approval of the Central Government and after previous publication. It is proposed to amend the said section so as to empower the Central Government to dispense with the condition of previous publication in certain cases, in the public interest. NEW DELHI; The 13th February, 2014.